It looks as though my predictions regarding the selection of finalists for the 2016 Telstra NATSIAAs have come true with more than a quarter of the fortunate 75 finalists originating in the southern cities rather than northern communities. This is surely not unrelated to the judging panel chosen to make the selections, consisting of Vernon Ah Kee, contemporary artist from Brisbane, Kimberley Moulton, Senior Curator, South Eastern Australia Aboriginal Collections, Museum Victoria in Melbourne and Don Whyte, legendary NT figure and the principal of Don Whyte Framing. Of course, it's hard to be absolutely certain when only supplied with the names (below) of the finalists, but I believe at least 19 are urban-based, Western-trained artists – quite against the flow of entries and finalists in recent years when many such artists seemed to lose interest in the Telstras. But there are also two remote names from the past reappearing – the great bark artist and Musee du quai Branly star, John Mawurndjul has entered for the first time this century, I believe; and the Tjanpi Weavers – winners in 2005 with their Tjanpi grass Toyota – have come in out of the deserts again as a collaborative group. There were 244 entries in the country’s most prestigious national Indigenous art award, the Telstra National Aboriginal and Torres Strait Islander Art Award (NATSIAA). Alec Baker, Andrew Snelgar, Anwar Young, Baluka Maymuru, Barayuwa Munungurr, Barbara Mbitjana Moore, Beryl Jimmy, Betty Kuntiwa Pumani, Beyula Putungka Napanangka, Bianca Beetson, Brendan Kennedy, David Frank, Eunice Napanangka Jack, Eunice Porter, Georgia MacGuire, Glen (Kei Kalak) Mackie, Graham Badari, Gunybi Ganambarr, Guykuda Mununggurr, Harold Joseph Thomas (Bundoo), Isaac Cherel, Ishmael Marika, Jack Green, James Tylor, Janine McAullay Bott, Jennifer Herd, John Mawurndjul, Kathleen Injiki Tjapalyi, Kaylene Whiskey, Kent Morris, Kieren Karritpul, Lena Yarinkura, Lenie Namatjira, Lisa Waup, Louise Daniels, Maath Maralngurra, Margaret Poulsen, Matjangka Nyukana Norris, Melanie Evans, Mumu Mike Williams, Muntaji Brumby, Naomi Hobson, Natalie Puantulura, Ngarralja Tommy May, Nici Cumpston, Nicole Monks, Nyapanyapa Yunupingu, Penny Evans, Pepai Jangala Carroll, Peter Waples-Crowe, Rachael Mipantjiti Lionel, Ray James Tjangala, Regina Pilawuk Wilson, Robert Pau, Ryan Presley, Seymour Wulida, Shirley Macnamara, Shirley Purdie, Simon Hogan, Spinifex Men's Collaborative, Steaphan Paton, Stewart Hoosan, Ted Laxton [Pitcha Makin Fellas], Teresa Baker and Clarise Tunkin, Tiger Yaltangki, Tjanpi Desert Weavers, Tony Albert, Vincent Namatjira, Watarru Collaborative, Wawiriya Burton, William Nyaparu Gardiner, Winnie Sampi, Witjiti George, Wukun Wanambi, Yaritji Young, Yinarupa Nangala. Scholes might wonder, though, why the art centre he's most associated with, Papunya Tula Artists seems to be represented by only a single artist in this year's Award. 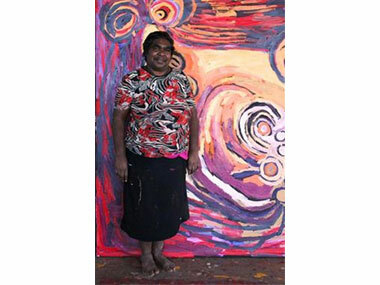 The 75 finalists’ works in this 33rd running of NATSIAA will be exhibited at MAGNT from Friday 5 August 2016, when six winners will be announced at a special awards ceremony in the evening. 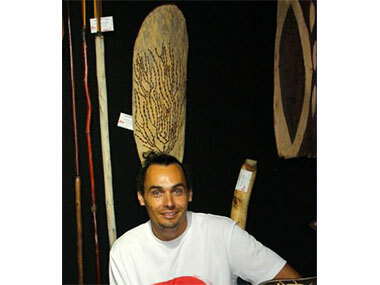 Andrew Snelgar is a Ngemba carver who started carving over 25 years ago in both hard and soft woods, producing shields, boomerangs and clubs. He is a finalist for this year’s Wandjuk Marika 3D Memorial Award. Artists: Alec Baker | Andrew Snelgar | Anwar Young | Baluka Maymuru | Barayuwa Munungurr | Barbara Mbitjana Moore | Beryl Jimmy | Betty Kuntiwa Pumani | Beyula Putungka Napanangka | Bianca Beetson | Brendan Kennedy | David Frank | Eunice Napanangka Jack | Eunice Porter | Georgia MacGuire | Glen (Kei Kalak) Mackie | Graham Badari | Gunybi Ganambarr | Guykuda Mununggurr | Harold Joseph Thomas (Bundoo) | Isaac Cherel | Ishmael Marika | Jack Green | James Tylor | Janine McAullay Bott | Jennifer Herd | John Mawurndjul | John Mawurndjul | Kathleen Injiki Tjapalyi | Kaylene Whiskey | Kent Morris | Kieren Karritpul | Lena Yarinkura | Lenie Namatjira | Lisa Waup | Louise Daniels | Maath Maralngurra | Margaret Poulsen | Matjangka Nyukana Norris | Melanie Evans | Mumu Mike Williams | Muntaji Brumby | Naomi Hobson | Natalie Puantulura | Ngarralja Tommy May | Nici Cumpston | Nicole Monks | Nyapanyapa Yunupingu | Penny Evans | Pepai Jangala Carroll | Peter Waples-Crowe | Rachael Mipantjiti Lionel | Ray James Tjangala | Regina Pilawuk Wilson | Robert Pau | Ryan Presley | Seymour Wulida | Shirley Macnamara | Shirley Purdie | Simon Hogan | Spinifex Men's Collaborative | Steaphan Paton | Stewart Hoosan | Ted Laxton [Pitcha Makin Fellas] | Teresa Baker And Clarise Tunkin | Tiger Yaltangki | Tjanpi Desert Weavers | Tjanpi Weavers | Tony Albert | Vernon Ah Kee | Vincent Namatjira | Watarru Collaborative | Wawiriya Burton | William Nyaparu Gardiner | Winnie Sampi | Witjiti George | Wukun Wanambi | Yaritji Young | Yinarupa Nangala.